Materials: 14K white gold, 14K red gold inlay; interiors of sterling silver. The ring to the right has a matte finish. 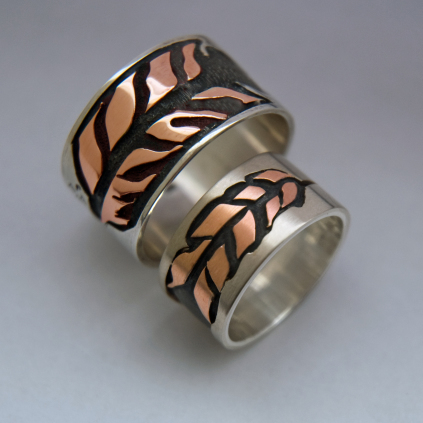 Ojibwe-style, white gold overlay wedding bands with stylized eagle feathers of red gold, title: Binesiwag (Thunderbird Spirits). This unique wedding ring set depicts the stylized feathers of two grandfathers that both belong to the class of BINESIWAG: the large, taloned birds that fly so high that their wing tips touch the clouds and the sun. The feather in the left ring is that of Migizi, the bald (white-headed) eagle, and the ring to the right features a feather of Giniw, the Golden (War) eagle. The red color of the gold feather inlays refers to the powerful medicine of Animikii Binesiwag, the Thunderbirds bringing nature rain and fertility, who come down to earth in spring as they migrate with the other birds, and return to their mountain in the fall. Ogimaa Migizi Eagle, the leading Binesi with the white head, is known by the Anishinaabe Peoples as spirit of the Eastern Direction, the one who looks after the people and insures GICHI-MANIDOO (The Great Mystery) each morning that the people still honor mino-bimaadiziwin (the good road of life) with their tobacco and sacred water songs. He symbolizes courage and pre-knowledge and is therefore emblematic of leadership. The Anishinaabe Peoples consider Migizi as a special emissary of GICHI-MANIDOO and his feathers, which are animated by his vision, strength, and courage, have always been used by our People as offerings and as decorations for our ceremonial costumes and regalia. Mishoomis Giniw, the Golden (or War) Eagle Grandfather with the black head, is known as the protector of Ziigwan, the Spring Grandfather who also lives in the East. Besides a spring time spirit who watches over all women - particularly those who are in new beginnings -, Giniw is the antipode of the almighty Migizi and the leading Binesi of the Wiindigookaanan, or Contraries – a special category of people who have gained some of the medicine, or power, of the ANIMKIIG, the Thunder Grandfathers. Giniw is known to land on trees struck by lightning. The Anishinaabe Elders tell us that carrying an eagle feather is a sacred act and that it comes along with great responsibilities since it is believed the power of a feather comes directly from the Thunderbirds; a person who is worthy of bearing an eagle feather must therefore acknowledge that he or she is recognized by the Thunder Grandfathers themselves as being able to use their formidable spirit powers. To be given a feather of Ogimaa Migizi or Mishoomis Giniw is therefore one of the greatest honors to receive, because it recognizes achievement and great acts or deeds.